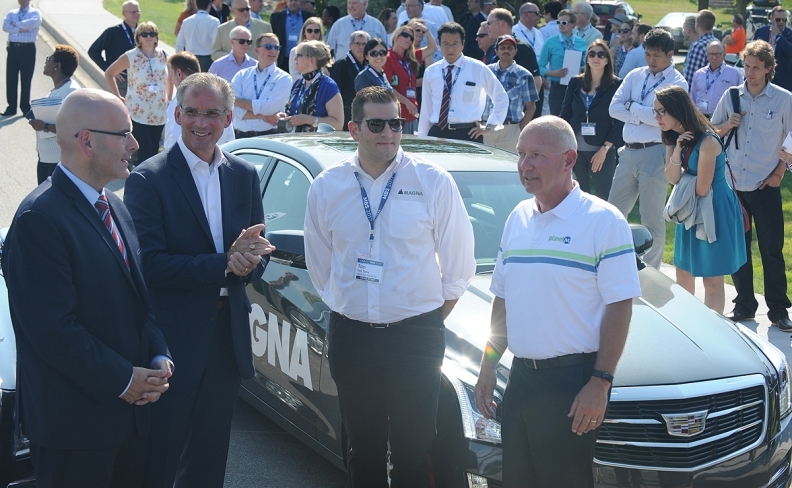 Top officials from Ontario, Michigan, Magna and Continental gathered at an autonomous vehicle event July 31 in Michigan. From left, Steven Del Duca, Ontario Minister of Transportation; Jeff Klei, president of Continental North America; Tom Toma, global product manager, Magna Electronics; and Kirk Steudle, director of the Michigan Department of Transportation. WINDSOR, Ont. -- Two global auto suppliers that are prominent players in the development of autonomous vehicle technology say the Canadian and provincial governments need to upgrade infrastructure that would allow the vehicles to be more accurate, efficient and safer on the roads. Continental and Canada’s Magna International are both working on software that can be used to deploy autonomous vehicles on a mass-market scale. Continental demonstrated its Cruising Chauffeur Level 4 autonomous technology during a cross-border jaunt to Ontario from Michigan and back July 31. Magna touted its Level 3 technology on the same journey, the same day. Representatives from both supply giants said they need government assistance – but not necessarily direct financial aid – to improve the technology. They both said it would help if there were more sensors along highways and city streets that could communicate with the vehicles. Tom Toma, Magna’s global product manager for automated driving, said infrastructure must evolve to support automated-driving vehicles. “Vehicle-to-infrastructure communication is the first logical step,” Toma said. That means things like “smart signs” that “talk” to a car long before it reaches an intersection or on-ramp need to be installed. Next-generation stoplights, equipped with sensors that can “see” when a car is approaching and can change colour in advance to make traffic flow more efficient, need to be erected. “You definitely need more of that, and it’s coming. There are companies working on that now,” Ross McKenzie said. Automakers and software companies could develop autonomous vehicles without any additional infrastructure, McKenzie said. “But the more intelligent infrastructure there is, the easier it will be to deploy an autonomous vehicle,” he said. “What we need from them, we’re getting pieces of today,” Toma said of the Canadian and Ontario governments. Ontario Minister of Transportation Steven Del Duca said the province is already preparing itself for the arrival of more connected and autonomous vehicles. “We take into account, as we develop highway expansions or whatever the case may be, that we need to be prepared for whatever it is that’s coming,” Del Duca said. The province is currently working on high-occupancy toll lanes in the Greater Toronto Area and Hamilton. “I know embedded in some of those infrastructure upgrades are what I’ll call the roughing-in for the potential applications of this [autonomous vehicle] technology down the road,” he said. He didn’t say in detail what is planned or how much money the government plans to spend. But, the province did announce in its budget in March that it would spend $80 million on autonomous vehicle research and development. Meanwhile, the federal government is looking into the development of a 5G network. Public consultations are underway. Navdeep Bains, Canada’s minister of innovation, science and economic development said the more connected cars there are on the road, the more stress there will be on wireless networks.